Figure 3.9: Tissue segmentation obtained with different number of clusters. of the data is poor. With k = 3, the liver, marrow, and spleen merge to form a cluster and the other regions merge to form a single cluster. With 5 < k < 7, the segmentation results improve because the blood vessels and stomach are visualized. However, the hepatic tumors are not seen and the liver and spleen are classified into the same cluster. With k = 8, the tumors are visualized and almost all of the regions are correctly identified (Fig. 3.9(d)). Increasing the value of k to 9 gives nearly the same segmentation as in the case of k = 8 (Fig. 3.9(e)). Further increasing the value of k, however, may result in poor segmentation because the actual number of tissues present in the data is less than the specified number of clusters. Homogeneous regions are therefore fragmented to satisfy the constraint on the number of clusters (Fig. 3.9(f)). Thus, 8 or 9 clusters appear to provide reasonable segmentation of tissues in the slice and this number agrees with the various kinetics present in the data. 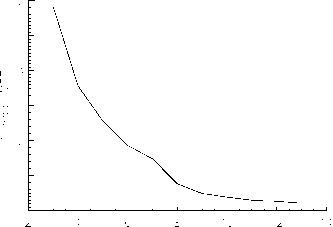 Figure 3.10 plots the average MSE across clusters as a function of k. The average MSE decreases monotonically, as it drops rapidly (k < 8) before reaching a plateau (k > 10). From the trend of the plot, there is no significant reduction in the average MSE with k > 12. Furthermore, the decrease in the average MSE is nearly saturated with k > 8. These results confirm the findings of the images in Fig. 3.9, suggesting 8 or 9 as the optimal number of clusters for this dataset. Figure 3.10: Average mean squared error (MSE) as a function of number of clusters. the criteria. Both criteria indicate that k = 8 is an optimal approximation to the underlying number of kinetics. It was found that a good segmentation can be achieved when the number of clusters is the same as that determined by the criteria. Conversely, the segmentation result is poor when the number of clusters is smaller than that suggested by the criteria and there is no significant improvement in segmentation when the number of clusters is larger than that determined by the criteria. The heuristic information given by both criteria also support our visual interpretation of the clustering results, suggesting that the criteria are reasonable approaches to objectively determine the number of clusters. AIC: Akaike information criterion; SC: Schwarz criterion. a Values in bold correspond to the computed minimum of the criterion. Figure 3.11: Single slice of simulated 2-[nC]thymidine PET study. Top row shows the original reconstructed images at (a) 15 sec, (b) 75 sec, (c) 135 sec, (d) 285 sec, (e) 1020 sec, and (f) 2850 sec postinjection. Bottom row shows same slice at identical time points after cluster analysis. Individual images are scaled to their own maximum. Application of the clustering algorithm to the simulated PET data is shown in Fig. 3.11. The number of clusters is eight, corresponding to the optimum number of clusters determined by the statistical criteria. The SNR of the images is markedly improved after clustering. In addition, the blood vessels are clearly seen in the frame sampled at 15 and 75 sec after clustering but not in the corresponding frame in the original data. In the original images, it is difficult to identify different tissues which maybe due to reconstruction effects and inhomo-geneous noise. However, the liver, spleen, muscle, marrow, stomach, and tumors are clearly delineated by the clustering algorithm (bottom row of the figure). Five cluster images were generated by applying the clustering algorithm to the noisy simulated dynamic images. The number of clusters k was actually varied from 3 to 10 and the optimal k was determined by inspecting the change of average MSE and the visual quality of the cluster images. Figure 3.12 shows the cluster images for k = 5 that was found to be the optimum number of clusters for this dataset. It was found that the tumor cannot be located when k was small (k < 4). The tumor was located by gradually increasing the number of clusters. However, there was a deteriorated segmentation of all regions when k was large (k > 7). Figure 3.12: Five cluster images obtained from the noisy simulated dynamic FDG-PET data. 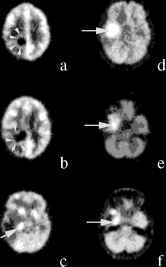 The images correspond to (a) ventricles and scalp, (b) white matter and left middle temporal gyrus (hypometabolic zone), (c) partial volume between gray matter and white matter, (d) gray matter, deep nuclei, and outer rim of tumor, and (e) tumor. Although the tumor was small in size, cluster analysis was still able to locate it because of its abnormal temporal characteristics as compared to the other regions. Cluster analysis also performed well in extracting underlying tissue kinetics in gray matter and white matter because of their distinct kinetics. On the contrary, the kinetics in the thalamus and the hypometabolic region were not separated from those in gray and white matter but this was not unexpected since their kinetics were very similar. Owing to the partial volume effects (PVEs), there were some vague regions whose kinetics were indeterminate (Fig. 3.12(c)) and did not approach gray or white matter. The algorithm was unlikely to assign such kinetics to the cluster corresponding to white matter or to the cluster corresponding to gray matter since the overall segmentation results would be deteriorated. Thus, a cluster was formed to account for the indeterminate kinetics. Figure 3.13: Tissue segmentation obtained from Patient 1 at (a) slice 10, (b) slice 13, and (c) slice 21; and Patient 2 at (d) slice 21, (e) slice 24, and (f) slice 26. The number of clusters used is eight. The locations of the solid hy-permetabolic portions of the tumors (arrows) and the small rim of increased glucose uptake (arrow heads) identified by cluster analysis are shown. are identified correctly by the clustering algorithm with the optimal value of clusters. For Fig. 3.14, the number of clusters was varied from 3 to 13 and only some representative results are shown. Similar to the simulation study, the segmentation results are poor when the number of clusters is small (k = 3), while the segmentation is gradually improved by increasing the number of clusters. Based on the AIC and SC, the optimum numbers of clusters for the selected slices (4, 19, and 24) were found to be 8, 8, and 9, respectively. It is not surprising that the optimum number of clusters is different for different slices because of the differing number of anatomical structures contained in the plane and the heterogeneity of tracer uptake in tissues. Nevertheless, the tumor (slice 4), right lung and muscle (slices 4, 19, and 24), blood pool (slices 4, 19, and 24), separate foci of increased FDG uptake (slices 19 and 24), and the injection site (slices 4, 19, and 24) are identifiable with the optimum number of clusters. Figure 3.14: Tissue segmentation of the dynamic lung FDG-PET data from Patient 3 in three selected slices: 4 (top row), 19 (middle row), and 24 (bottom row) with different number of clusters. (a) k = 4, (b) k = 7, (c) k = 8, (d) k = 9, (e) k = 10, and (f) k = 12. (I = injection site; B = blood pool; L = lung; T = tumor). 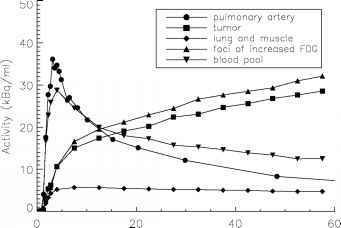 Figure 3.15: Extracted tissue time-activity curve (TACs) corresponding to the tumor, lung, and muscle, foci of increased FDG uptake, and blood pool. The measured blood TAC at the pulmonary artery is also shown. TAC: Time-activity curve; ROI: region of interest. Values are given as estimate ±% CV. slice 19), foci of increased FDG uptake (from slice 24), and the blood pool (from slice 19) using the corresponding optimal value of clusters. The extracted tissue TACs obtained by cluster analysis and manual ROI delineation were fitted to the three-compartment FDG model using nonlinear least squares method and the results obtained for the tumor tissue TAC (Patient 2) are summarized in Table 3.2. There was a close agreement between the parameter estimates for the tissue TACs obtained by different methods in terms of the estimate and the coefficient of variation (CV), which is defined as the ratio of the standard deviation of the parameter estimate to the value of the estimate. Similar results were also found for other regions.